There is a great deal of talk about this photograph that was inside the card. It apperas to be a photo of 2 mailbox keys with something attached to it, a pen light or something of the sort. Here's a long shot... The Minutemen used a lot of different P.O. Boxes. When they would mail literature, they always put a P.O. Box for a return address. 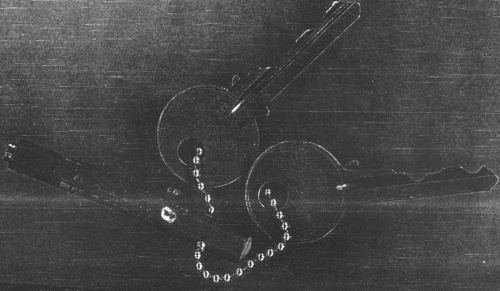 The numbers of the keys posted above, which are believed to be P.O. Box keys, look like 79408 and 59851. I doubt anything will come of this, but I will see if I can find any Minutemen box numbers that match either of these. Was it ever determind as to the thing attached to the chain if is a light of some kind or something else? And the keys were for post office box? There have been a few people who have said different things about the object attached to the chain. A penlight I think is the most popular choice, but others have said it could be a small pen magnet, which was often used by miners and some people theorize that Zodiac may have had some sort of background in mining. There is writing on the thing so it most likely had the name and phone number of a company on it. I think it could be a huge clue if it could ever be determined the name of the company, but it's not readable. The keys have numbers on them which are very hard to read. They look like PO Box keys, but it's not certain. The number one one of the keys is either 79408 or 79408. I personally think it says 79408. The other key I think says 59851. People have checked PO Box numbers, zip codes and any other thing that could be thought of, but no connection made to any suspects. I think that it was a magnet. I just wanted to point out that I believe the Zodiac's REAL handwriting is what is on this envelope. In the letters it is the same but a sloppier version of it with intentional spelling errors. 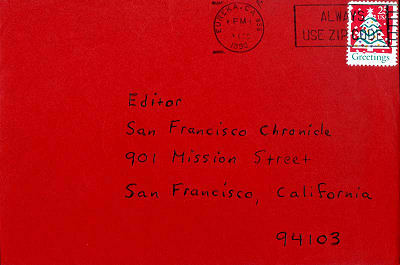 JohnFester wrote: I just wanted to point out that I believe the Zodiac's REAL handwriting is what is on this envelope. In the letters it is the same but a sloppier version of it with intentional spelling errors. 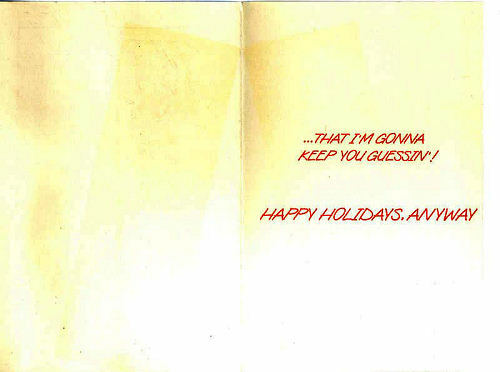 But also the envelope handwriting looks just like Ted Kaczynski's. Sample of Ted's handwriting to compare. 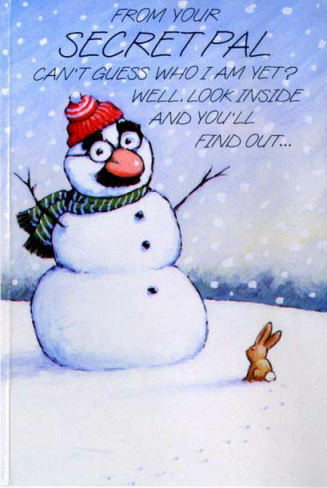 The 'mask' on the snowman looks like Eugene Levy. Eureka + Snowman image = Ulrika Jonsson. Eureka = Ulrika, an easy though far from obvious step, (especially if you're not British or Swedish). Snowman - because she was a weather-girl at the time. The photocopy accompanying the Eureka card features a little torch, key chain and keys. If you look at the key chain, it has been formed into a heart shape, (deliberately so in my opinion). 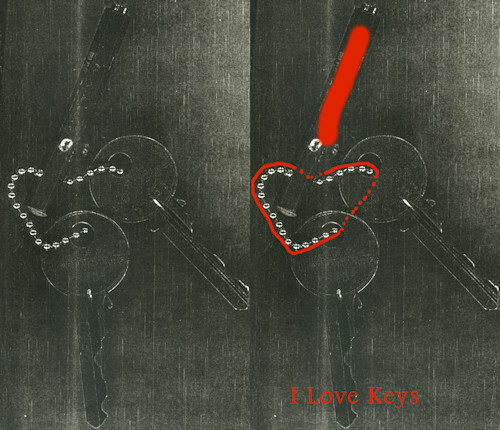 The message when read being "I Love Keys". At the time, Ulrika Jonsson was working with Richard Keys, on a programme broadcast to a British & Swedish audience, (both of which may have a Zodiac connection in my opinion). The reason for this bizzare connection ? Quite simple if you believe the track I've been on for months now..... JONSSON ! Surprisingly perhaps, there is a Johnson Key island. Almost as bizarre as my Ulrika connection, there is a Little Torch Key, I kid you not ! If I know anything about the Zodiac by now, both answers could be right. That's to say, he very often had two or more messages / answers to a lot of things he sent for publication.